So, acknowledge the patient-your customer, say hello, good morning, howdy, how are things going for you? But acknowledge them. Introduce yourself. Let them know why you’ve entered their room and what you need to do, how long it will take, and explain anything to them about what is about to take place. Check the patient’s wrist band, talk about why you do that and relate it to the safety precautions of the hospital. If you are an introverted person, you can chat about these kinds of things that are quality standards and safety precautions in the hospital. And, remember to thank them for their time and cooperation. Most of us like to be thanked, acknowledged, and truly “seen”. A little kindness goes a long way in a fast paced hospital, with people using big words and talking over the customer-client-patient. Remember to make eye contact, smile, and keep your heart open. A patient feels it, the family feel it. I feel it when I go to the grocery or department store whether someone is present with me or not. And, if they are not, repeatedly, I take my business elsewhere. Life is too short. 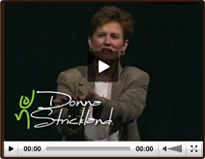 This entry was posted by Donna Strickland in Employee Engagement, Leadership and Team Development. Bookmark the permalink. Follow comments with the RSS feed for this post. Post a comment or leave a trackback.